Unbeknownst to De Palma, Blow Out was a signal post for the cinema, the last one for the seventies. In my mind, maybe in yours as well, it marked the end of the great seventies experiment where production companies and studios paid good cash for writer-directors to put whatever the hell they wanted to up there on the screen, with little interference. The movie has the feel of what came before and none of what came after. Great assessment and you can read more of his post here. Here are more links to other De Palma related writings that have recently come to my attention. These are ones not written specifically for the Blog-A-Thon. Blow Out: Brian De Palma - Only the paranoid survive by Ratnakar Sadasyula at Passion for Cinema Mission to Mars: A nerd's rhapsody: In defense of Mission to Mars by Ray Sawhill at Salon.com Murder à la Mod: Murder à la Mod (1968) by Adam Zanzie at Icebox Movies Redacted: Brian De Palma Interview by Movie Geeks United! at blogtalkradio Sisters: Behind the Scenes With My Favorite Actors: Margot Kidder in Brian De Palma's Sisters by Jeremy Richey at Moon in the Gutter General Discussion: Brian De Palma Tribute by Movie Geeks United! at blogtalkradio Momento Brian De Palma by Georgina Spigott at Quixotando More to come later today. Oh, how I wish I had seen "Blow Out" already so that I could know what Greg is talking about! 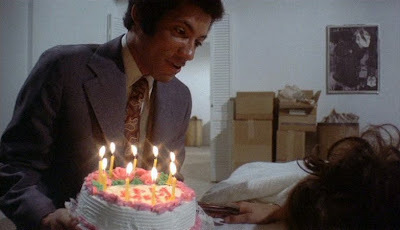 One question, though: was it really the last De Palma film to retain a spirit of the seventies? "Scarface" is another one of those films that feels like it gave the filmmaker permission to put out "whatever the hell he wanted to on the screen", unless you count the MPAA forcing De Palma to tweak some of the violence just to earn an R rating. Any feedback? Scarface is all about eighties excess. Nothing seventies "what's happening to our society" about it. Just one point I hope to address in my upcoming entry. Blow Out was as close to the 70's spirit, u can check out my take on it also. Vis a vis Scarface, for me it was pure 80's, OTT, campy( the climax), but still had that restless feel and energy, pulsating through every inch of it. It was like watching a volcano erupt and then die out, fascinating to look at, as long as ur not too close to it. Martin Scorcese, got it right during the preview, "You guys are great, but those in Hollywood would not like it, its about them". I guess Marty was referring to his own frustration with the studios in Hollywood, and the failure of his dark comedy After Hours. Oliver Stone, incidentally, meant it as a satire on the "Yuppie, greed is Good lifestyle" and then later on he would explore it more in Wall Street. It is quite coincidental though the day i was discussing Blow Out, i got the news of Ted Kennedy, passing away, and then the mention of the Chappaquidick incident. Blow Out is replete with ironies. Travolta's frantic dash to save Nancy Allen, takes place during a "Liberty Day" parade in Philadelphia, the very city, where the Declaration of Independence was signed, becoming a venue where that freedom is in danger. Good point. "Scarface" does also have a very technoish theme song ("The Limit"), which I guess was a sign that De Palma had abandoned the disco flairs of the previous decade and was now jumping over to the dance, hip-hop revolution. Case in point: Frankie Goes to Hollywood in "Body Double". Scarface's music was totally techno(Giorgio Moroder), as was most of the 80's movies OST's. Also the backdrop of Miami was an interesting choice. Miami i think is the most "Hispanicized" city after LA, and during the 70's, 80's it had a kind of Sin City reputation of being a point for drug running, crime, so i guess that is one reason why BDP choose it, as also the fact that after Havana, this is the city that has the next largest population of Cubans. Regarding Pacino's "Cuban" accent, i think maybe Tony should be the better person to verify it's authenticity. Also the fact of Cubans generally being loud and flashy( again could be one of those generalizations). Adam, I hope you get to see it soon. Like Tony said, the seventies movies had social consciousness that went along with them and a darker outlook, unafraid to have an ending the audience might not be happy about. By 1982 the success of a feel good movie like E.T. signaled the eighties had begun. Interestingly, you can see it with the two Star Wars sequels as well. Empire Strikes Back from 1980 is a seventies movie thematically, Return of the Jedi is eighties through and through. Mhmm. And I suppose that had "Scarface" been made in the 70's, Montana would have lived at the end. But the 80's was the time of hard-hitting Reaganomics, and audiences wanted to see their antiheroes sprayed with bullets before the films ended. I think that's kind of nasty- although I cherish every minute of "Scarface" regardless. If you do a Part 3, could you link to my review of Greetings? Adam, but you need to remember Scarface's roots; the early Hollywood gangster pictures, which had to be made to a certain set of screen 'principles' one of which was that an anti-hero had to, in some way, be punished for his actions. You know what my original inspiration for that point was, Ryan? Your Sopranos quote in your old Public Enemies review. I just knew that was gonna come in handy someday. You're right, though. Not just about the 30's and beyond, but even in the 60's; Bonnie and Clyde and Butch and Sundance all die. The 70's was, I guess, the only merciful decade for antiheroes. Unless you buy the theory that Travis Bickle dies and the whole ending of Taxi Driver is one big "dream", Lynch-style.